Considerably more head scab (FHB) has appeared this week across KY. The wet May we have just experienced has apparently provided for multiple infection periods and an extended window for symptom expression. A properly timed and sprayed fungicide application appears to have made a significant difference in FHB compared to where fields were not sprayed. But it would be unreasonable to think the benefit exceeds 50% control in any field. Modern fungicides simply are not that good against FHB, even when application and timing are ideal. Hopefully the benefit associated with spraying will carry over into DON levels at harvest. Control in fields that were sprayed too late (post infection) is poor (as expected). Stagonospora leaf and glume blotch are also getting quite severe in many fields and I am starting to see a lot of leaf rust, even in fields that were sprayed (fungicide protection is wearing off). In some cases, leaf and glume blotch are quite severe in treated fields. While modern fungicides do an excellent job in managing leaf and glume blotch, fungicide must be applied before infection occurs. In many fields, applications timed properly for FHB control (early flowering), were probably too late to achieve good leaf and glume blotch control. The fact is, the main infection period for both diseases can be the same, but many times is not. This year, fields treated while the heads were emerging seem to show the best control of leaf and glume blotch. Many (most?) years it is hot and dry by the time we get to the end of May. Not this year. Our wheat crop is steadily declining and will probably continue to do so until harvest maturity is reached. Since the first week of March new-crop soybeans (November 2009 futures) have gained about $2.40 per bushel. There are a number of factors pushing soybeans higher. First, the value of the U.S. dollar relative to foreign currencies has been steadily declining since March, thereby making U.S. products more appealing to foreign nations. China has shown strong interest in purchasing U.S. old-crop soybeans. Second, production in South America has been shrinking, leaving fewer tons of available soybeans for export. This pushes importing countries to the U.S. to purchase soybeans. And third, soybean meal has had good export numbers, thereby increasing demand for soybean crushing. These three effects have taken previously average ending stocks and made them tight. Currently, the USDA has ending stocks at 130 million bushels or 80 million bushels fewer than the February report. Ending stocks are the lowest since the 2003-2004 crop year. According to the USDA's latest Crop Progress report, released today, 62 percent of the corn has been planted. This is less the same time last year when we were at 70 percent and less than the five-year average of 85 percent. For Kentucky, 45 percent of the corn has been planted compared to 39 percent this time last year and to 89 percent for the five-year average. Across Kentucky there are some fields of corn that have been flooded. Generally, if soil temperatures are above 70 degrees Fahrenheit for more than 24 hours, then corn will not survive. Usually the status of the corn crop will be known about two or three days after the flood event. Much more details about flooded corn are given in AGR-193: Evaluating Flood Damage to Corn. Some of this corn was stacked with both RR2 and LL traits. In these cases, the two best options are Select Max or paraquat plus linuron. The Select Max will provide better control, but will require no re-planting of corn for about 6 days. The paraquat + linuron will not provide as good of control, but will allow immediate re-planting of corn. AGR-6: Chemical Control of Weeds for Kentucky Grain Crops, page 22 contains more details about removing corn for a re-planting situation. Up to this point in the season, wheat diseases have been relatively minimal. Early-season soil-borne viruses were not a significant problem, and all indications are that arthropod (insect/mite) –vectored viruses will also be minor players this year. Other foliar fungal diseases, such as those that make up the leaf blotch complex; leaf, stripe, and stem rust; and powdery mildew have also been confined to the lower canopy or can barely be found in many fields. I attribute the minimal fungal disease picture to cooler than normal conditions this spring. In general, the excellent production practices of Kentucky’s wheat producers (planting date, fertility, variety selection, etc.) have also kept disease pressure low. I believe the recent block of rain will change everything for the worst. I already see indications of this in my plots at Princeton. As we all know, it started to rain the last couple days of April and it has been wet, more or less, ever since. A few very windy days before the rain set in and then the rain, has significantly limited the number of acres that were treated with a fungicide. Fortunately, some farmers were able to arrange for aerial applications in some fields, but ground applications were greatly reduced compared to normal. The bottom line is that many fields are completely unprotected, and many that did get sprayed were sprayed earlier or later than is desired for maximum protection from fungal diseases. 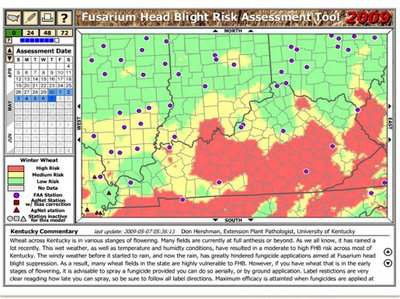 To make matters worse, disease models indicated that the Fusarium head blight (FHB; head scab) risk was high across most of the state during the wet period. Most wheat fields in the state were in some stage of flowering during the wet period. Flowering is the stage when wheat is most susceptible to infection by the fungus that causes FHB, Fusarium graminearum. So connecting the dots: moderate to high FHB risk (spore production)……limited fungicide applications….highly susceptible crop stage (flowering)…..conditions favoring spore release and infection (wet, cloudy, humid)…..and it is easy to see how FHB could be a serious problem this year, even in treated fields. I say even in treated fields, because it is well known that even the best foliar fungicides provide only suppression of FHB, not true control. When disease pressure is high, fungicides may help, but yield and grain quality can still be seriously impacted. Over the last couple of days, I have received numerous queries asking if I thought spraying wheat that has finished flowering should be considered. My response was (and is) that no fungicides are labeled for applications this late and even if they were, they would not do much good. Fungicides targeted at FHB must be applied BEFORE infection occurs to be of any value; they do not have post-infection activity. Thus, if heads of non-sprayed wheat were infected by F. graminearum during the recent rainy weather, applications made now would not help significantly. Fungicides would most certainly afford some control of other fungal diseases, but if the crop is past flowering, I do not believe they can develop fast enough to severely impact yield. That is, they would have to reach damaging levels before the crop reaches the soft dough stage, and I do not believe this will happen. The situation is different for the small number of fields that are still flowering. As long as the label restrictions can be met, there may still be some value in spraying crops that are at full bloom or earlier. Whatever is done, be sure to follow the pesticide label! We will know the full extent of FHB damage in Kentucky by the end of May. Some farmers in the extreme southwest part of the state are just now beginning to see FHB symptoms. This is the first year that soybean rust (SBR) has successfully overwintered in Alabama, Georgia and Louisiana, without a break in detection. Weather conditions have been favorable to highly favorable for SBR development in those states, plus Arkansas, Florida, and Mississippi for much of this spring. There has been some new SBR activity in Florida and disease incidence is increasing on Kudzu in positive sites in Louisiana, but there has been no spread to new Kudzu patches or to soybean to date. Specialists in many southern states are expecting SBR to begin spreading into new areas soon, provided conditions remain favorable for disease development. Delayed planting of soybean in many states, due to wet conditions, may push crop maturity back a few weeks. This, plus the potential for earlier disease development due to successful overwintering in the mid-Gulf region, could increase the potential for SBR to cause more crop damage then we have seen to date. Of course, if conditions turn drier, this increased disease potential may translate into nothing. We all hope this is the case. In any event, it would be prudent to keep tabs on this developing situation. The following was taken from the most recent Corn and Soybean Newsletter on corn planting dates. Use a corn hybrid with the Bt trait for corn borer. University of Kentucky research shows a yield benefit and an economic benefit to Bt corn borer hybrids planted in May. The later the planting date, the greater the yield benefit for the Bt hybrid. Possibly switch to an earlier-maturing hybrid. Based on calculations of growing degree days remaining in an average season, hybrids with relative maturities of 118-day (and less) will reach physiological maturity (black layer) before frost in west Kentucky even if planting is delayed until late May. For late May plantings in central and eastern Kentucky, hybrids of 116-day relative maturity or less are likely needed. If planting occurs in early to mid-June, then a switch to hybrids of 113 to 116-day relative maturities will likely be needed. For extremely late plantings (after mid-June), hybrids of 110 to 113-day relative maturities or less are needed. Keep the seeding rates and row spacing the same. Two exceptions: if someone convinced you to try 38,000 seeds per acre, try it in a small area instead of a large field. Your odds of getting decent yields from late plantings are good, but your odds of getting excellent yields are not. If you have the ability to plant narrow rows or twin rows, the late planting date could make for some excellent comparisons. We know that going to narrow rows in late-planted soybeans improves yields. Perhaps the same could occur in corn. Some on-farm comparisons would be excellent. One caution here: setting up a really good comparison takes time, and when fields are suitable for planting again, you won't have much time. For more information on corn planting date and hybrid options, refer to publication AGR-195: Replanting Options for Corn that includes a table on Kentucky location, planting date, and expected date to reach black layer (physiological maturity) for three hybrid maturities. For more questions about corn planting dates, contact your local county extension agent. Much of the wheat-growing area is in red or yellow, meaning that we have high to medium risk for FHB, according to the model. See Don's post from May 6, 2009 for more details about head scab and management options. Armyworm Flight 2009: No consistent story; but there will be caterpillars! There will be armyworm caterpillars in susceptible host (corn, small grains, grass forages), as there are every year. In fact if we apply the day degree model to the very first moth captures there are likely caterpillars already appearing in both western and central Kentucky. These will be among the earliest of caterpillars. Remember if you are in a location warmer than where our traps are located then caterpillars will appear earlier. If you are in a cooler location they will appear later. I have received one report of armyworm caterpillars on the heads of wheat (though I have not seen this myself) from a southern Pennyrile area county. While moth captures in our traps do not indicate a major outbreak year, we certainly have experienced weather that selects for the survival of the caterpillars. Typically armyworm populations do better in cool wet weather. At least in western Kentucky we have certainly seen such weather. Historically, grass forages and corn suffer the most damage from armyworm, but small grains are certainly at risk, particularly if the caterpillars are feeding on the heads. These publications may also be available at your local County Extension office. Even though our trap counts do not suggest a big problem, the weather patterns certainly imply that scouting susceptible hosts is still important. I request that anyone that finds an armyworm infestation that requires treatment or should have been treated, please let me know at: doug.johnson@uky.edu. Wheat across central and west Kentucky (which makes up the bulk of the wheat acres in the state) has been in various stanges of flowering since early last week. Many fields are currently at full anthesis or slightly beyond. As we all know, it has rained a lot over the past 5-8 days across much of the state. This wet weather, as well as temperature and humidty conditions, have resulted in a moderate to high FHB risk across most of central and west Kentucky. The windy weather before it started to rain, and now the rain, has greatly hindered fungicide applications aimed at Fusarium head blight suppression. Some spraying was probably possible on Monday and Tuesday of this week, but the current storm system moving through the state will effectively eliminate the possibility of ground spraying for today (Wed), probably tomorrow, and maybe into Friday-Saturday. Aerial application will also be challenged. The bottom line is that most wheat fields in the state will be highly vulnerable to FHB. By time spraying is possible again, it will be too late to spray most fields due to label restrictions. Plus, from a practical perspective, once infection has occurred, fungicides (which are not that good against FHB in the first place) are of little value. I rarely prognosticate epidemics, but it seems that nothing is in our favor, and everything is pointing towards an significnat FHB episode in the state. Fields that were in full flower early last week may escape significant infection since they were beyond the most susceptible infection stage by the time the rains began. Likewise, crops that have yet to flower, may escape infection. But the acres that fit either of these two scenarios is rather small compared to the whole. If it is any consolation, remember that when FHB pressure is high (such as I believe it is right now), fungicide-treated crops can still be severely impacted by both FHB and DON. That is, only 30-50% suppression can be expected when fungicides are applied under the best of scenarios. One final point. Some may be thinking that they wish they had sprayed while their crop while it was still heading out, but before flowering. Doing so would have provided little benefit against FHB due to the limitations of fungicides against FHB and the fact the new tissue that emerges after application would be (for all practical purposes), unprotected. I am sorry to have to predict this gloomy situation. We will know how accurate my words are by mid-May. That is about how long it will take for FHB symptoms to be expressed. Low temperatures and breaks between rain events (up until this past event) have kept the FHB predictive model from indicating even moderate FHB risk (up until now). The block of rain we have just experienced has changed that, so the FHB models are now showing moderate to high risk for spore release in much of central and west KY. I believe conditions will be ripe for spore release beginning Monday night. Spore release happens mostly happens at night and is actually favored more by high humidity than rain. Rain can give you splashing of spores, but it also washes spores out of the air and off of plants. Infection, on the other hand, requires free moisture, so infection generally is greater when spores have been released and transported to heads during dry, but humid, periods at night, followed by rain the next day or so to support infection. It is complicated and that is why we don't always have a lot of FHB. It is rather hard to get! I encourage growers with decent crops that are just entering flowering to to spray as much as they can Monday and Tuesday and into Wed. I realize that getting sprayers into fields will be hard, so that is a complicating factor that may prevent many fields from being sprayed this year. It is what it is. More wet weather is anticipated beginning Wednesday. I have had several questions asking about how late one can spray and still get FHB suppression. That is pretty simple. Most labels restrict application to early flowering or at most 50% bloom. Thus, there is not much of a decision to make. The days to harvest restriction is very specific for all fungicides labeled for wheat. The key thing to remember is that according to the FHB models, up to the present moment, not many spores have been available to spread to heads, let alone infect heads. But after today and the gloves come off unless it turns hot and dry fast. This could be a bad FHB year in light of the lack of spraying and/or difficulty in getting fields sprayed. But the timing of this rain coinciding with the completion of head emergence or flowering in many fields is hard to deal with. If fields had sprayed before the rain, it might have been too early to get good coverage on the heads. Corn planting in May will germinate, emerge, grow and develop in warmer temperatures compared to corn planted in April. Two critical stages of growth for early season management of corn are at growth stage V6 and V8. The growing point normally moves above ground on V6 corn (corn with six visible collars). If possible, N fertilizer should be applied by V8 (see related article in this newsletter). Many postemergence herbicide labels have applications restrictions for corn at either V6 or V8. Based on data from the National Corn Handbook, corn should reach V6 in about 475 Growing Degree Days (GDD) and V8 in about 610 GDD. Using data from the University of Kentucky Ag Weather Center, over the last five years at Princeton, corn seeded on May 1 would have reached V6 and V8 about 9 and 12 days earlier, respectively, than corn seeded on April 1. Corn seeded on May 15 would have reached V6 and V8 about 13 and 16 days earlier, respectively, than corn seeded April 1. As you plant corn late, and try to get soybeans planted as well, your postemergence herbicide applications and sidedressing of N fertilizer will need to occur earlier, relative to planting. More information about late planting of corn is available in the Corn and Soybean Newsletter and on the Grain Crops Extension website at the Late Corn, 2009 page. At this late stage in the season, priorities should be on planting the corn crop, first, then applying needed fertilizers after planting. Fertilization after the crop is planted is not yield-reducing and, in some cases, can actually cause nitrogen (N) fertilizer use to be more efficient. There may be a few situations where P and K were not applied prior to corn planting. If the soil test P and K levels for a field were in the medium to high range, any fertility added this year would generally maintain these soil test levels and would have little, if any, effect on yield. This would probably be the situation in a majority of Kentucky corn fields. Therefore, adding P and K fertilizers after planting would not be a problem and, if the field's P and K soil test levels are in the upper part of the medium range or higher, the P and K could be delayed until this fall. If a field tests in the low soil test range, the P and K should be added this season, but can be delayed until after planting. P and K fertilizers are soluble in water, so they dissolve with rain and move into the soil fairly quickly. They will only move into the top 2 to 3 inches, but this will be enough to make them available to the plant, in most situations. If the field was no-tilled or has a lot of residue on the surface, many corn roots will be close to the surface and will take up added P and K. A clean tilled field might result in reduced uptake. This would more than likely only be a problem if P and/or K were in the low soil test range and there was an extended period of dry weather that resulted in the top few inches of soil becoming very dry. Once the optimum planting date has passed, the yield loss from further delayed planting far exceeds the yield loss associated with post-planting N applications. Your goal should be to get corn planted as soon as soil conditions permit. Your corn-N management situation, field by field, falls into one of two categories: a) some or all N has already been applied; b) no N has been applied. Your N loss situation has also shifted. Early N applications should be managed to avoid denitrification loss, while later applications need to be made so as to avoid volatilization loss. Because of the wet spring, the soil will contain less residual N, or N mineralized from organic matter, than normal. For the full article, go to the Corn and Soybean Science Newsletter. Sidewall compaction can result from planting a crop when the soil is a little too wet. This damaging effect can be even greater on soils with a relatively high clay content at the surface. It occurs when the double disc opener leaves the side wall of the planting furrow smooth and compacted (slick as opposed to shattered) as it pushes the soil aside. The trailing press wheel then increases the compaction with its downward force. If the soil stays very moist or wet, the roots may be able to penetrate the compacted mud at the sidewall and expand further into the soil. However, if the weather turns dry after planting, the sidewalls then harden, and roots are not able to push through since there are no pores or cracks. This causes the roots to grow within the planting furrow, along the direction of the row. Although plants may look normal at emergence, they will begin to show nutrient and drought stress after the corn is several inches high.Â This problem may be more common in no-tillage because no-tillage soils have better structure, and it is easier to traffic them in a wetter condition. The old adage of "waiting on no-till" is a good one. Sidewall compaction can also occur with conventional tillage. If you can mold the soil into a ball in your hand and the soil ball will not easily crumble apart, it is too wet to plant. Rainfall patterns have delayed corn planting throughout much of the state. Late planting increases the risk of damaging levels of certain foliar diseases, particularly gray leaf spot, southern leaf blight, and northern leaf blight. When there is a mix of fields planted early near fields planted late, the early fields can be a source of spores for late-planted field. The early fields act a bit like “Typhoid Mary”. Compared to early fields, late-planted corn is often at an earlier stage of crop development during periods of spore release and leaf blighting. Since leaf blighting early in plant development is more harmful to yields than late-season blighting, the late-planted fields have the potential to be hit harder than earlier fields. Fields not planted until the last week of May or into June have the highest risk of foliar disease. Producers planting corn late this spring should use hybrids with adequate levels of resistance to gray leaf spot. Selecting hybrids with good resistance to gray leaf spot is especially important if the field is under conservation tillage (30% or more residue cover) and has had corn anytime in the last two years. Also, if a field has a recent history of southern leaf blight or northern leaf blight, consider those diseases in hybrid selection. Of course, many producers have already purchased seed for this spring. If a field is sown late and the hybrid doesn’t have substantial resistance to the diseases mentioned above, a fungicide application is more likely to be cost-effective. Figure 1 lists the factors that increase the likelihood of getting a positive economic return from a fungicide application in corn. The more of those that are in place, the more likely a corn field is to benefit economically from a fungicide application. If you do choose to use fungicides, it is always a good idea to leave at least one untreated strip in the field in order to see if the fungicide provided any benefit. Sometimes it will but often it won’t, and getting on-farm evidence helps in making future farming decisions. Figure 1. 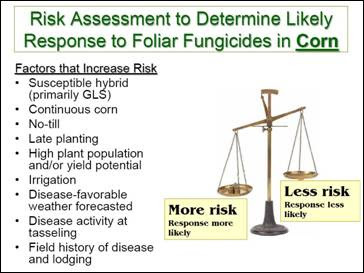 The more of these factors are in place, the higher the probability of getting a positive economic return from a foliar fungicide application. Planting date is one of the more important factors determining the potential for insect problems in field corn. Many may not realize it, but the time at which the seed goes into the ground determines which insect pests are more likely to be encountered. Some pests are favored by early planting dates while others are more likely to show up in damaging numbers in late planted corn. There are two reasons for differences in pest problems due to planting date. First, for many corn pests, the plant has specific vulnerable stages. For example, with cutworms, the plant is susceptible to cutworm damage anytime between emergence and when the plant reaches 12 to 18 inches in height. Second, pest population numbers tend to run in cycles. Usually a pest reaches damaging levels only during certain periods of the season. With black cutworm, because it is a migratory pest, usually it will only reach damaging levels in the late spring. Fields with early and normal planting dates usually escape significant cutworm damage because the plants have grown out of the vulnerable stage by the time the damaging populations arrive. Wireworms and the damage they cause on the other hand are favored by early planting. The reason for this is that the cool soil slows germination, emergence and growth. Late planting into warmer soils speeds germination, emergence and growth thusly limiting wireworm damage. With treated seed and later planting dates, wireworm is less likely. There are two generations each of European and Southwestern corn borer each year. The first generations attack in late June and early July, and the second generations begin their assaults in early to mid August. Corn borers prefer whorl-stage corn for egg laying. Studies at the UK Research Center in Princeton Kentucky have shown that corn planted after May 10 is at much greater risk to yield loss from late season European and Southwestern corn borers. Growers using Bt corn often save this seed for later plantings to protect against corn borer attack. Fall armyworm is another pest that migrates from southern states each spring and is favored by late planting dates. This pest also tends to prefer to lay eggs on whorl-stage corn. Corn which planted after June 1 and that is still in the whorl stage in late July and early August is more likely to be damaged by fall armyworm. Not all Bt corn for corn borer provide effective control of fall armyworm. Insecticides used for fall armyworm control in whorl stage corn need to be applied before the larva forms a frass plug in the whorl of the plant, as the larva feeds under the plug and the plug limits penetration of the spray into the whorl. Unfortunately, we often have little control of planting date and are at the mercy of the weather. But understanding what your potential problems are should help you manage your crop more effectively. This article and others about late-planted corn can be found at the Corn and Soybean Newsletter. Wet weather since late March has delayed corn planting. According to the National Agricultural Statistics Service, only 20% of intended corn acreage was planted in Kentucky as of April 26 compared to the 5-year average of 57%. If recent weather forecasts hold true, corn planting will continue to be hindered through early May. So, when can we expect to lose yield on corn based on planting date? Research indicates that corn should be planted by early- to mid-May to avoid yield losses. 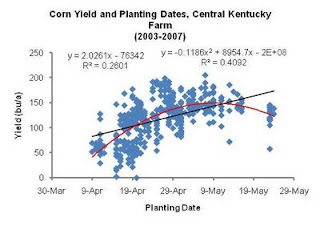 In west Kentucky, corn should be planted by May 1-5, according to six years of research at that the UKREC in Princeton, KY Extrapolating these results to other areas of the state: corn planting should be completed by May 1 in extreme western Kentucky; by May 5-10 in west-central Kentucky; and by May 10-15 in eastern Kentucky to achieve maximum yield potential. There is an average yield loss of 1 to 2 percent per day for corn planted after early May (west Kentucky) to mid-May (eastern Kentucky). Most of you reading this and looking at weather forecasts know that you will not get all of your corn in the ground before these dates. Don’t panic. There is more to this story. The corn yield penalty for delayed planting is not constant and can be quite variable from year to year (Figs. 1 and 2). While our research indicates yields losses for corn planted sometime after the first or second week of May, statewide average yields tell a slightly different story. If at least 80% of the corn crop is planted by the third week of May, then we still have a chance for good yields (Fig. 1). The trend for corn yields to be lower as planting is delayed across the state has a very low correlation (R2 = 0.3). The statewide averages indicate that more than just planting date goes into making good yields. 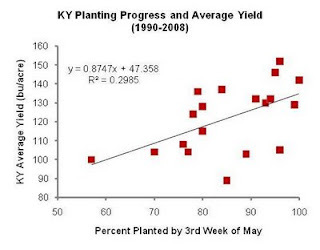 Actual planting date and yield data from a central Kentucky farming operation would imply that the optimum window for planting is around the first or second week of May (Fig. 2). As you can see, there is a lot of variability is this data as well, indicating that more than just planting date determines yield. Some of the other factors that affect corn yield include timely rainfall, adequate heat units, low stress at pollination, adequate nutrients, etc. So, if the rest of 2009 turns out to have favorable weather, we would expect any potential yields losses from late planting to be much less than predicted. Of course, if 2009 turns dry like 2008, well… let’s just hope it doesn’t. If you have the ability to plant narrow rows or twin rows, the late planting date could make for some excellent comparisons. We know that going to narrow rows in late-planted soybeans improves yields. Perhaps the same could occur in corn. Some on-farm comparisons would be excellent. One caution here: setting up a really good comparison takes time, and when fields are suitable for planting again, you won’t have much time. For more information on corn planting date and hybrid options, refer to publication AGR-195 (Replanting Options for Corn) that includes a table on Kentucky location, planting date, and expected date to reach black layer (physiological maturity) for three hybrid maturities. Figure 1. Statewide average corn yield relative to the percentage of acres planted by the third week of May (source: National Agricultural Statistics Service). Figure 2. Planting dates and yields for each field in a central Kentucky farming operation from 2003 through 2007, regardless of hybrids, soil types, field size or seeding rates. The extremely wet spring experienced over much of Kentucky has delayed anhydrous ammonia applications. When the soil finally is dry enough for field work to begin, corn producers likely will not be willing to further delay planting to allow anhydrous ammonia applications to become safe. The standard recommendation is to wait 7 to10 days after injection before planting corn, but delayed planting may also reduce grain yield. A second option is to plant corn and then sidedress anhydrous after corn emergence. If anhydrous ammonia is applied before planting, then care must be taken to avoid seedling injury. Free ammonia (NH3) in the soil is extremely to toxic emerging seedlings and their roots. When anhydrous is injected into the soil, it immediately begins to convert into ammonium (NH4+) by associating with hydrogen ions. Hydrogen ions can come from soil cation exchange sites, but most come as a result of splitting water molecules, leaving behind hydroxyl ions (OH-). This reaction dramatically increases the soil pH at the injection site, which allows some free ammonia to exist in the soil for some time. Several soil factors, including moisture content, texture and temperature, affect the length of time that ammonia persists in the soil. 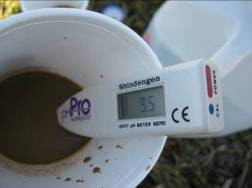 Low soil moisture causes the ammonia to persist longer in the soil, as does cooler soil temperatures. However, shot-term ammonia concentrations are higher in warm soils. Excessive soil moisture increases chances of ammonia loss. For more on this issue, go the Corn and Soybean Newsletter. 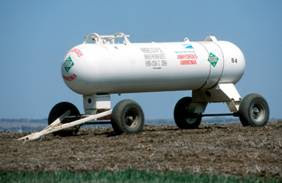 Many anhydrous ammonia applications were delayed because of the wet weather. A handheld pH meter can help you quickly determine the soil pH, and thus, the risk of ammonia injury to germinating and seedling corn.